Landing pages are essential to the health of your website, but it’s easy to overlook them as part of your ongoing content marketing strategy. 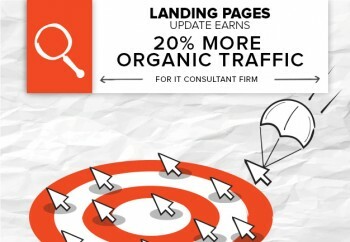 Most marketers assume landing pages are educating visitors and driving conversions. But that doesn’t mean they’re reaching their full potential for results. Has it been too long since you revised your pages to reflect your products or customers’ positions? Are there opportunities you’re missing to drive traffic to your site and convert new prospects? For one of our customers, the answer was yes. In addition to the written assets, our team was producing infographics and white papers for the website. But no matter how much, or how diverse the content you create, you need great landing pages to extract value from these strategies.The company needed product-specific landing pages that writers could link to in blog posts, which would lead readers toward conversion opportunities. It didn’t have these. Instead, the company had multiple products grouped on the same pages. When the company was working on a site redesign, our content marketing strategists suggested we create some new content for pages so we could break this information apart. Use keywords & SEO best practices: Use a core keyword in the page title and at least once in the content. Also include keywords in meta descriptions, which should be capped at 150 characters to display in SERP snippets. Focused content that drives interest: Landing pages need to be concise (between 300-500 words), and clearly explain what you’re offering and how it solves customers’ problems. Calls to action: You need to have clear CTAs that show people what they’re supposed to do next, what action to take, what they can get from you. Use visuals & video: Website visitors form an impression of your brand within seconds, and you need strong visuals to show them who you are (since you can’t count on them sticking around long enough for you to tell them). We added a video to one of our client’s landing pages and it saw a 357% increase in conversions. Test, test & test some more: 52% of marketers say A/B testing is the most effective way to optimize their pages for conversion success. Around 80 percent of marketers say their landing page optimization strategies are successful, and they’re using techniques like these to drive traffic and sales. Our client is already seeing the fruits of its labor, as the brand’s search presence grows and brings more visitors to the website. But this is just the start. The next step is to increase the authority of those hot-off-the-press pages by getting them in front of industry influencers and prospective customers. A solid backlink profile will catalyze these initial results and make the company stand out as a leader in the marketplace.